German historian of mathematics; born at Mannheim, Germany, on Aug. 23, 1829. He comes of a family that emigrated to Holland from Portugal, another branch of the same house having established itself in Russia, the land of Georg Cantor's birth. In his early youth Cantor was not strong enough to go to school, and his parents decided to educate him at home. Later, however, he was admitted to an advanced class of the gymnasium in Mannheim. Thence he went to the University of Heidelberg in 1848, and soon after to the University of Göttingen, where he studied under Gauss and Weber, and where Stern awakened in him a strong interest in historical research. After taking his degree of Ph.D. at the University of Heidelberg in 1851, he went to Berlin, where he eagerly followed the lectures of Lejeune-Dirichlet; and upon his return to Heidelberg in 1853, he was appointed privat-docent at the university. In 1863 he was promoted to the position of assistant professor, and in 1877 he became honorary professor. Cantor was one of the founders of the "Kritische Zeitschrift für Chemie, Physik, und Mathematik." 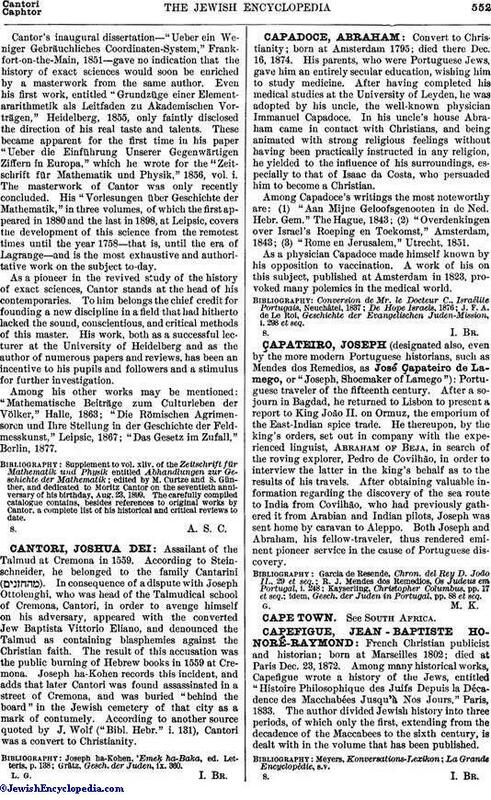 In 1859 he became associated with Schlömilch as editor of the "Zeitschrift für Mathematik und Physik," taking charge of the historical and literary section of this excellent publication. 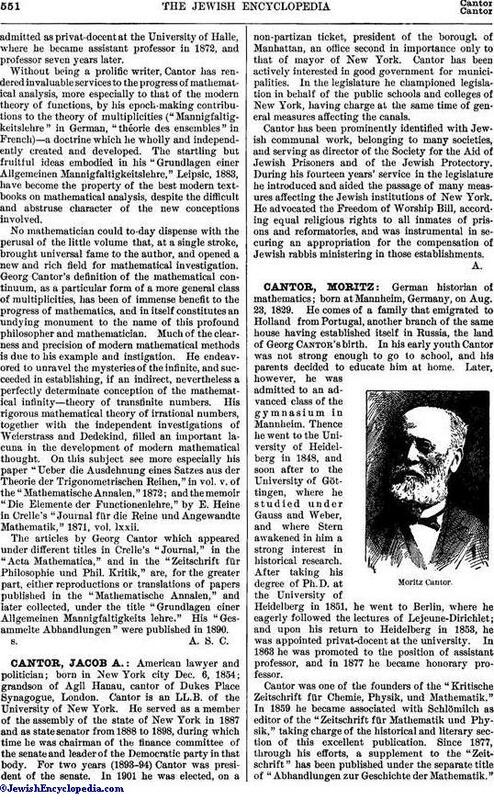 Since 1877, through his efforts, a supplement to the "Zeitschrift" has been published under the separate title of "Abhandlungen zur Geschichte der Mathematik." Cantor's inaugural dissertation—"Ueber ein Weniger Gebräuchliches Coordinaten-System," Frankfort-on-the-Main, 1851—gave no indication that the history of exact sciences would soon be enriched by a masterwork from the same author. Even his first work, entitled "Grundzüge einer Element-ararithmetik als Leitfaden zu Akademischen Vorträgen," Heidelberg, 1855, only faintly disclosed the direction of his real taste and talents. These became apparent for the first time in his paper "Ueber die Einführung Unserer Gegenwärtigen Ziffern in Europa," which he wrote for the "Zeitschrift für Mathematik und Physik," 1856, vol. i. The masterwork of Cantor was only recently concluded. His "Vorlesungen über Geschichte der Mathematik," in three volumes, of which the first appeared in 1880 and the last in 1898, at Leipsic, covers the development of this science from the remotest times until the year 1758—that is, until the era of Lagrange—and is the most exhaustive and authoritative work on the subject to-day. As a pioneer in the revived study of the history of exact sciences, Cantor stands at the head of his contemporaries. To him belongs the chief credit for founding a new discipline in a field that had hitherto lacked the sound, conscientious, and critical methods of this master. His work, both as a successful lecturer at the University of Heidelberg and as the author of numerous papers and reviews, has been an incentive to his pupils and followers and a stimulus for further investigation. Among his other works may be mentioned: "Mathematische Beiträge zum Culturleben der Völker," Halle, 1863; "Die Römischen Agrimensoren und Ihre Stellung in der Geschichte der Feldmesskunst," Leipsic, 1867; "Das Gesetz im Zufall," Berlin, 1877.
edited by M. Curtze and S. Günther, and dedicated to Moritz Cantor on the seventieth anniversary of his birthday, Aug. 23, 1899. The carefully compiled catalogue contains, besides references to original works by Cantor, a complete list of his historical and critical reviews to date.